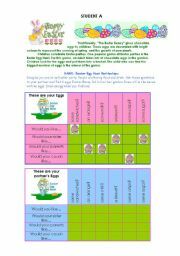 Vocabulary useful to write a cake´s recipe. 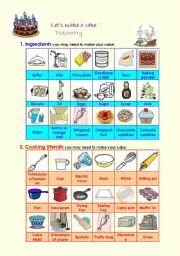 It includes 3 sections: ingredients, cooking utensils and verbs (also useful to practise Imperatives). Students learn the jobs of people working at school. 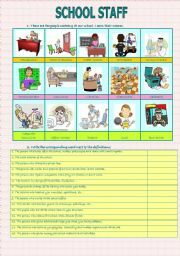 The worksheet includes 4 exercises: Pictionary, definitions, wordsearch and questions about workers´ names. KEY included. 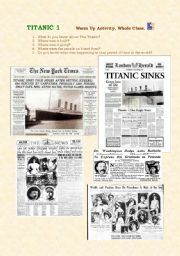 1st Part of a lesson based on the Titanic. Oral activity to introduce the topic. Sorry, I couldn´t upload all worsheets togheter. 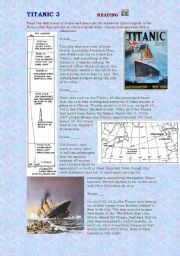 2nd Part of a lesson based on the Titanic. Pre-reading activity to introduce vocabulary before reading the text. 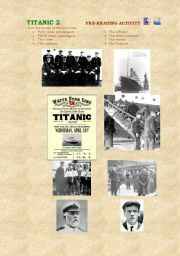 3rd and final part of a lesson based on the Titanic. Reading to put paragraphs into order and comprehension questions. Reading and multiple choice exercise about Thanksgiving. Speaking Activity to be done in pairs to practise "There is /are", "How much/ many?" and "Food". Pictures and idea taken from "English File 1", OUP. 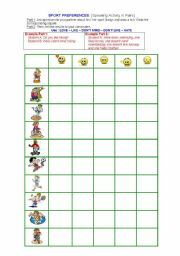 Worksheet to practise Past Simple while learning about Thanksgiving.